Welcome to the SimpelFact help pages. Where it is incomplete or unclear to users, this document will be updated on an ongoing basis. 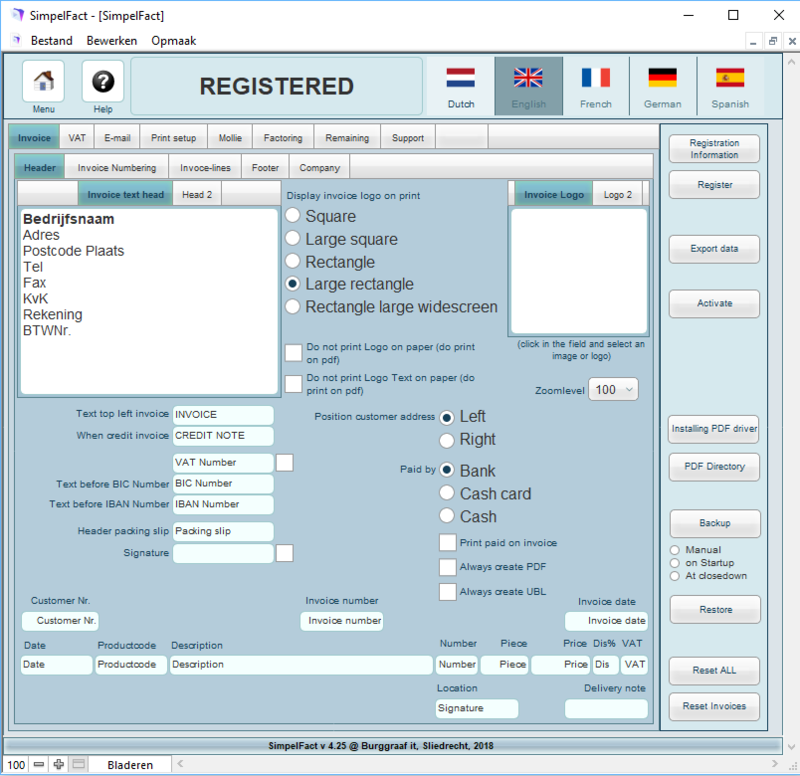 Restoring data from a previous version of SimpelFact From version 2.40 onwards, this is installed in a different location than for earlier versions of SimpelFact. The procedure is as follows (procedure can also be followed for earlier versions and for the Mac): BEFORE PERFORMING SUCH AN ACTION, ALWAYS ENSURE THAT YOU HAVE A MINIMUM OF ONE BACKUP IN A SAFE PLACE. SimpelFact will give the message that the restore is complete. 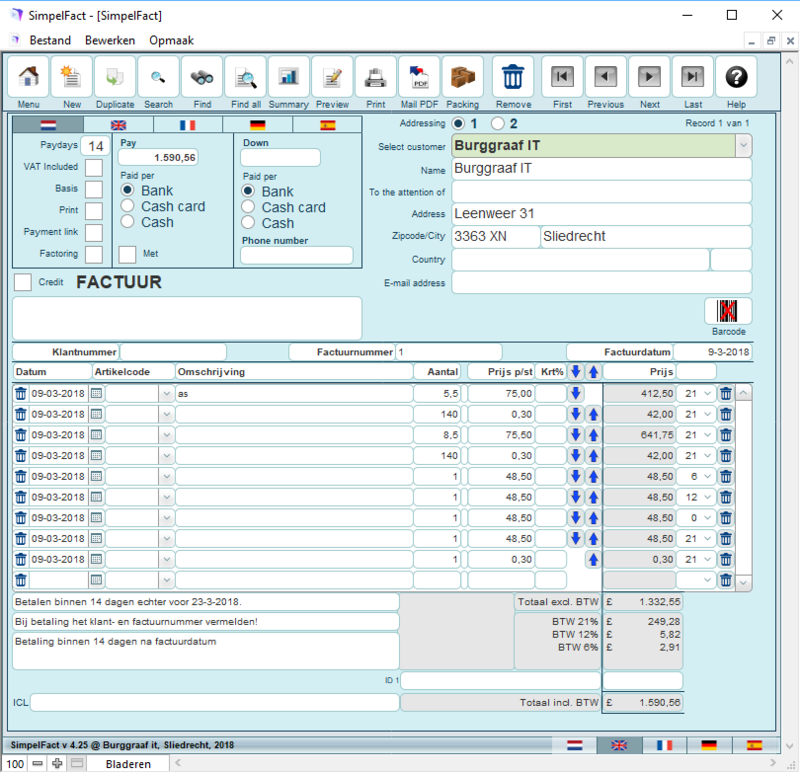 SimpelFact is no more and no less than a simple invoicing (Simpel Factuur) application. The idea behind SimpelFact is to keep it this way. An asterisk ( * ) with an explanation indicates that an option comes with the registered version. Invoice Header Text Enter the header text here that must appear on the top left-hand side of your invoice, such as your company details. Invoice Logo Paste your logo here (right-click in the field and paste or insert a logo). The logo will be printed on the top right-hand corner of your invoice. Display on Print The logo can be displayed/printed in four ways on the invoice. ‘Small’ or ‘large’ square and ‘small’ or ‘large’ rectangle (landscape). Next Invoice no. / ID This option can be used to set the next invoice number, and the numbers will always progress by the addition of 1. For example, if invoice 2006001 is created, the following invoice will be 2006002. If after using the number 2006001 an attempt is made to set 2005001 as an invoice number, an error message will appear as the same number / ID could theoretically occur. The field should be seen as a number. Amounts incl. VAT This option allows ‘incl. VAT’ to be filled in on all invoices by default (item amounts can be incl. VAT). Please note: the use of different VAT types in a VAT invoice can lead to rounding differences! 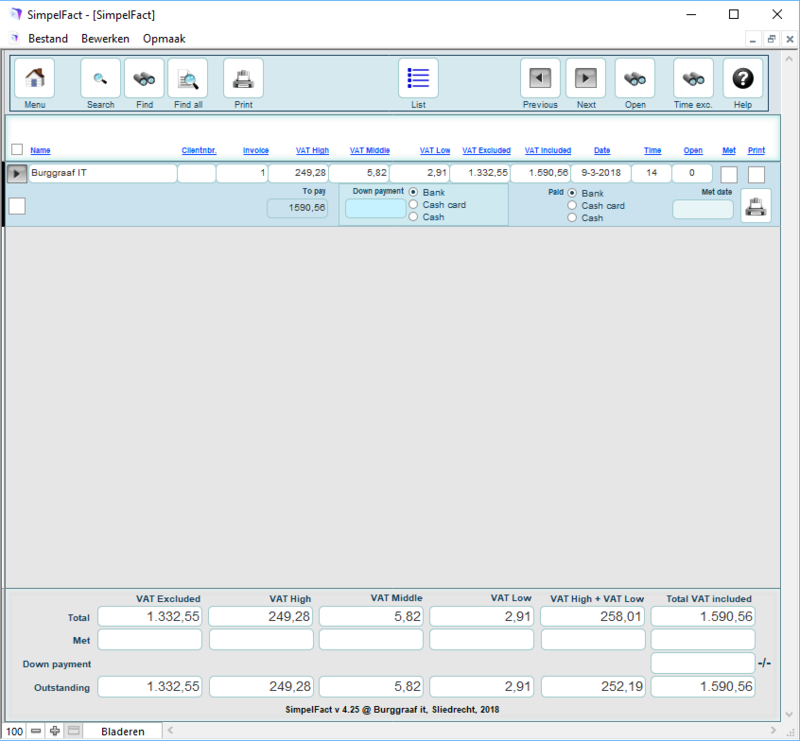 Show / Print VAT on Invoice* This option allows the VAT rate to be printed at the end of each line on the invoice. VAT Text/letter Instead of Figure* Instead of printing the VAT percentage, this option allows the letter for each percentage to be printed, such as L, H and 0. No VAT Text on Invoice* With the option Show / print VAT on invoice, you can specify the VAT at line level when creating an invoice. If you do NOT want to allow this information to appear at line level on the invoice, you need to uncheck this option. Text (Top Left of Invoice) Specify the text here that is to appear to the top left under the header text, such as the word INVOICE. Naming Invoice Headers Specify the text here that you would like to appear by default in the invoice header. You can change this value for a specific invoice within the invoice itself. The headers from the second line are kept in a list from which you can choose again by clicking on the header. Text for Amount Excl. VAT… Fill in here the text that is to appear by default next to the total amount of the invoice, and if desired, choose another text if no VAT is processed in the invoice. VAT Text When No VAT This is the text which appears beneath the subtotal if the invoice does not contain invoice lines with VAT specified. Default Total Including VAT Text Standard text which appears at the bottom of the invoice when there are invoice lines with VAT specified. Total Text When Total VAT=0 Text that appears at the bottom of the invoice when there are no invoice lines with VAT. Indication if Stock is <= 0 Select this option to indicate when the stock of an item is <= 0 at the moment an invoice line is entered. It is assumed that the item is listed in the item file. € Symbol with Totals Select this to make the € symbol visible with totals and to print it. Standard Payment Period Specify the number of days within which invoice payment must have occurred. If no number or a different number is specified for a selected contact*, then this value is used. Payment within X Days Select this in order to have the sentence ‘Payment within X days but before <datum>’ appear at the bottom of the invoice. Concluding Sentence on Invoice Text that has to appear at the bottom of your invoice. Standard Comments on Invoices Comments can be placed at the bottom of each invoice. If you fill in text here, it will appear in the comments field when you create a new invoice (and can also be adjusted in your invoice). If you do not fill in anything, the comments field remains empty. VAT High, Low and standard If you wish to use multiple types of VAT in an invoice*, these can be specified here. In order to use a particular value as a default, click Set this as default after the desired value. If an item appears on an invoice that does not appear in the item file, then the default VAT value will be used for this item. Change Item VAT It doesn’t occur very often, but the government occasionally makes changes to the VAT. This option allows you to adjust the VAT percentage of articles from an old value to a new one. By clicking on Execute, this value will be changed for the articles. Sending a PDF If this option is selected, an invoice will be added as an attachment to an email when you click on the Mail PDF button. In order to do this, SimpelFact calls upon the standard mail client on your PC. The mail address specified for the contact is used in the email. If this option is not selected, no email is created but the PDF is saved to the PDF folder that has been specified for this purpose. Default Mail Subject Default text for the email subject line. Default Mail Description Default text for the description of the email. Mollie If you use Mollie then you can enter the details here and find more information. Factoring If you use Factoring then you can enter the details here. Registration Details Takes you to the SimpelFact Registration Page. 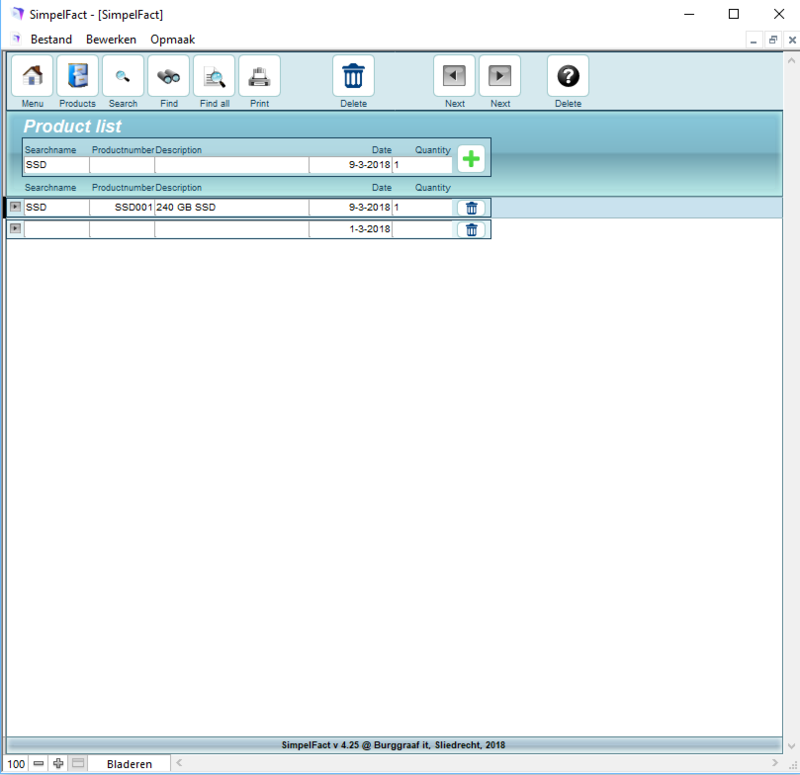 Export Data All data from SimpelFact is exported in tab-delimited format to files (exp_<tabelnaam>.tab) to the SimpelFact root (C:\Program Files\Burggraaf it\Simpelfact). Update data This button can be used to carry out any update again and to import ‘old data’ from an old SimpelFact version. PLEASE NOTE: all data entered will be lost. Only use this function when you can restore a full backup of your software! Print Setup SimpelFact’s default printer setup settings can be set independently of the system’s printer settings. Backup Create a backup of the SimpelFact database: Manual: By clicking on the Backup button in Settings // At start-up: When starting up SimpelFact // At close-down: when closing down SimpelFact. The first time you do this, you will need to specify a folder where the backup can be saved. Restore Restore a backup that you made earlier. Reset Everything Reset the entire application. All details will be deleted, including the registration. Reset Invoice Delete all invoices from the application. All other information will remain. For the purpose of any stock counts, the balance data must be re-entered! After a reset, despite having a registered version you may still see the message ‘Free Version’ at the top of the screen when you go to invoices. This message will disappear as soon as there is at least one invoice in the system. This button brings you to a pop-up screen where you can enter the registration details you received by email after paying for your registration. After entering the details, click OK and your version will be registered. All of the extra options in SimpelFact are now activated. Search name The search name is a general name for your contact. Often, you know your contact by his/her personal name, rather than by the company name. The selection list in the invoice* contains the search names. The other details in the invoice are retrieved on the basis of the search name. * Of course, you can also use the company name as a search name. Both the search name and the company name must contain a value. 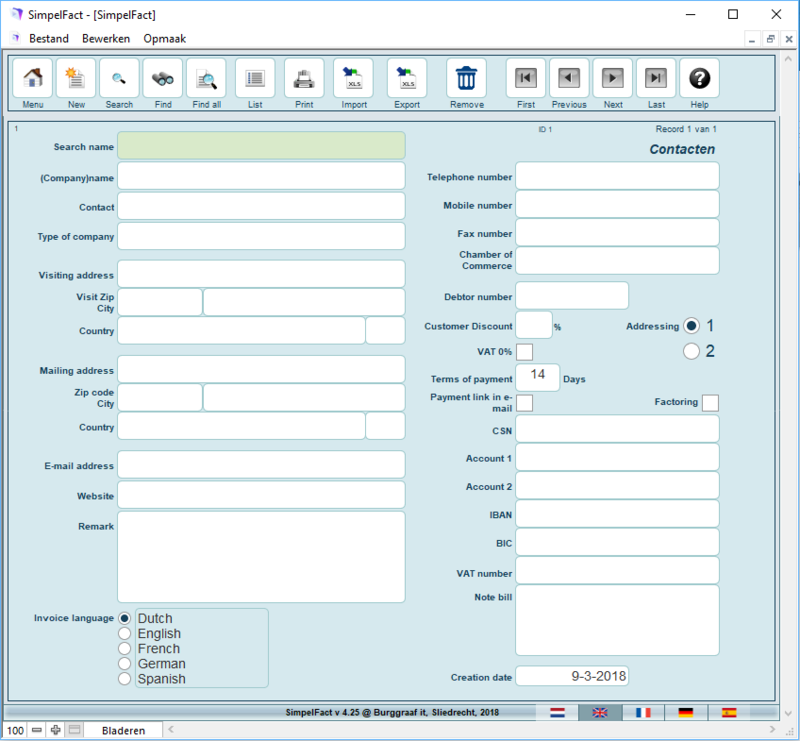 Company type Fill in the type of company if necessary. A list is generated from all of the previously known values in the contacts file, so that you can easily select this later. VAT Number When the VAT number is entered, this is retrieved upon selecting a customer in the invoice*. Payment period The standard value entered in the settings is retrieved when a contact is set up. The value specified here will be used in the selection of a customer in the invoice*. Click on the Import button in Contacts in order to start importing contacts. Clicking on the Import button in the Import items starts up the import dialogue (if necessary, delete all existing records from the import). You will first see the Open file / Open bestand dialogue. In this dialogue box, you select the file that you want to import. There are various file formats possible. We have chosen an Excel file for our example. 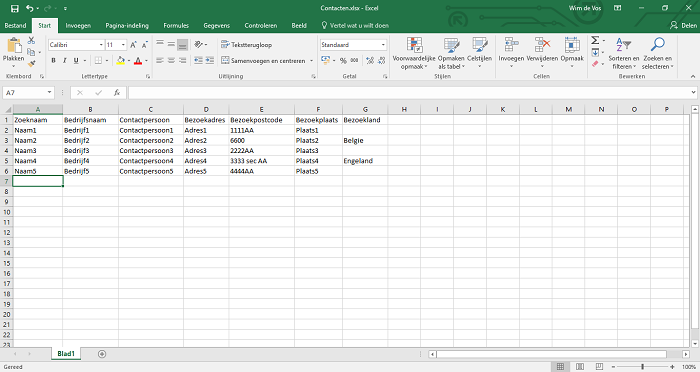 After opening the Excel file, you will be asked which worksheet you want to import. By default, this is usually the first worksheet. The first row in our example file contains column titles. Although it isn’t necessary, this makes it easier to ensure that the right values are entered in the right fields. Using the up and down arrows centre right, you can move the ‘target field’ with the mouse in order to import everything into the right fields. Using the arrows to the centre left (the arrow that points to the right), you can click to make the import turn a value in a field on or off. This means you can import exactly what you want to. If a field name is grey in colour, no values can be imported into it. 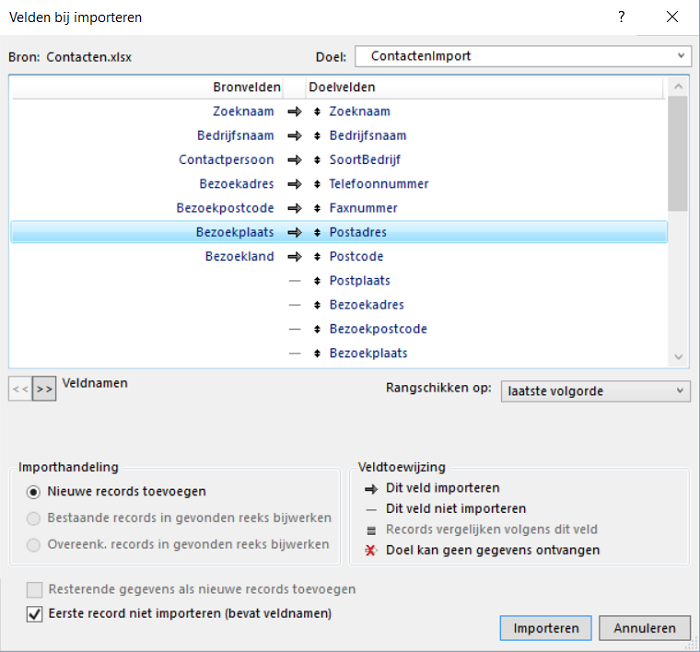 If the first row of the table to be imported doesn’t contain items but field names, as in our example, select the box Don’t import first record / Eerste record niet importeren. 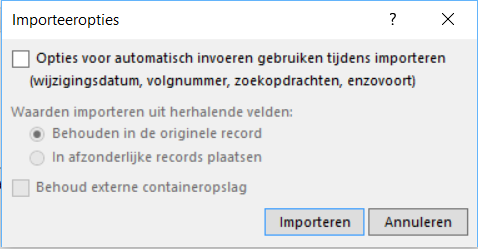 Click on Import / Importeren to start the import. In the following dialogue box, you will be asked if you want to make use of the import options. Do not select this, and click on Import / Importeren. Once the import is complete, you will see a dialogue box showing the result of the import. Click OK to complete the import. After this, all of the contacts will have been imported into the file. Most of the fields speak for themselves. When you select the contact in the invoice*, the postal address will be retrieved. Search name The search name is a general name for the item. You often know an item by its general name rather than the item number. The selection list in the invoice* contains these search names. The other details in the invoice are retrieved on the basis of the search name*. Of course, you can also use the item number as a search name. After the item has been selected, the printed invoice will display the item number instead of the search name. Opening balance Fill in the balance here, such as the number of items that you had at the moment you created the item record. Balance date Fill in the date on which you entered the opening balance value, if necessary. Number received/sent The aggregate value of the projects which have been sent out according to the invoices and/or which you recorded as having come in under goods received. The aggregate value is calculated based on the ItemID generated by the application. Minimum stock Specify the number of items to be considered a minimum stock level for a product. If this value is the same as the End balance value (Opening balance + Number received – Number sent = End balance), the text ‘Order!’ appears on the screen. Image Place a photograph of your item here (right-click in the field and paste or inert an image). If you go to Item entry from Items, you can enter your received (ordered) items for the stock. Select the item from the list on the basis of the search name, enter the date and the number and click the Add button. The entry will appear at the top of the list and will be counted along with the total Number received. The principle associated with importing items is based on synchronisation. This means that you can import items multiple times and a check will be carried out as to whether the item already exists, on the basis of the unique search name. If the item exists, the item will be updated with the values in the current imported file. All values will then be updated. If you attempt to import a VAT value that has not been entered in Settings in SimpelFact, then this will be replaced by the standard VAT listed in Settings during the transfer. Clicking on the Import button in Import items starts up the import dialogue (if necessary, delete all existing records from the import). You will first see the Open file / Open bestand dialogue. In this dialogue box, you select the file that you want to import. There are various file formats possible. We have chosen an Excel file for our example. After opening the Excel file, you will be asked which worksheet you want to import. By default, this is usually the first worksheet. The first row in our example file contains column titles. Although it isn’t necessary, this makes it easier to ensure that the right values are entered in the right fields. Using the up and down arrows centre right, you can move the ‘target field’ with the mouse in order to import everything into the right fields. Using the arrows to the centre left (the arrow that points to the right), you can click to make the import turn a value in a field on or off. This means you can import exactly what you want to. If the import table contains multiple columns, this is not a problem (up to seven values per row or seven columns can be imported). If a field name is grey in colour, no values can be imported into it. If the first row of the table to be imported doesn’t contain items but field names, as in our example, check the box Don’t import first record. 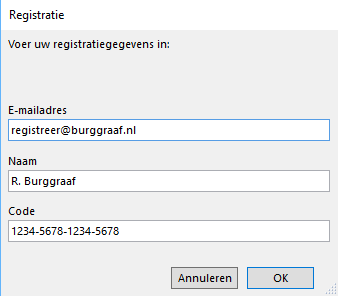 Click on Import / Importeren to start the import. In the following dialogue box, you will be asked if you want to make use of the import options. 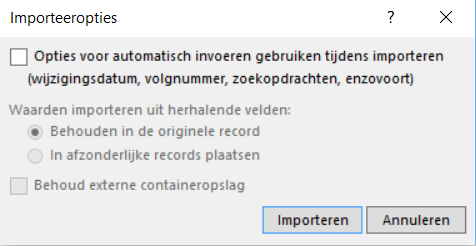 Do not select this, and click on Import / Importeren. Once the import is complete, you will see a dialogue box showing the result of the import. Click OK to complete the import. The only thing that remains is the transfer/synchronisation with the item file as described earlier. Click Transfer to complete this synchronisation. If an item exists, it will be updated, and if it does not exist, it will be created in the item file. The synchronisation can be done by comparing the search name with the search name in the item file. Perhaps you do not use item names, but item numbers instead. During the transfer, you will be asked if you would like to make the item numbers the same as the search names. If you choose Yes, then all of the item number values will be replaced with the search name values. In that case, you can import all of the item numbers in the search name field without having to import item numbers. During the transfer you can then choose to copy these to item numbers. New – Create a new invoice. The invoice type and whether there are one or more types of VAT depend on the choices made in the settings. Mail PDF – Create an email with an attached invoice in .PDF format or create just the PDF version of the invoice in a specified folder (see settings). When you create a new invoice, general information as entered in the Settings will be incorporated. In the registered version, clicking on the grey field above the name and address details will reveal a list of all of the search names out of Contacts. If you select a contact, the name and address details from Contacts will be incorporated into the invoice. VAT included This option allows you to treat the item amounts entered as VAT included, with the total including VAT being calculated from the item amounts and the amount excluding VAT and the VAT itself being calculated from this. Please note: the use of different VAT types in a VAT invoice can lead to rounding differences! Payment days This specifies the payment period in number of days. If you wish, you can adust this here for this specific invoice. Payment link If you check this option and you have a SimpelPay subscription, a payment link is automatically created so that your customer can pay instantly. If you check this option and you have an agreement with the Factoring company, your invoice will be paid immediately. Paid By clicking in this field, you can indicate that the invoice is paid. This value is the same as the one that appears in the invoice statement. Print After the invoice has been printed, this value is selected. If you wish to change this, for example if something has gone wrong during printing, then you can do so manually by clicking in the field. This value is the same as the one that appears in the invoice statement. VAT Number If a customer is chosen from the contact overview*, the VAT number will be displayed in this field if it has been specified. Customer number If a customer is chosen from the contact overview*, the customer ID will be displayed in this field. Invoice number The invoice number is generated automatically in this field. If you wish, you can adjust this value manually. Invoice date The current date is filled in here when you create a new invoice. You can adjust this manually using the format dd-mm-yyyy. Item code If you click on this field, the list with the item search names will be displayed in the line*. Select the correct item from among the search names and the other information will be retrieved from the item database. In the invoice print layout, the item number will be displayed instead of the item search name. If a non-existent search name is specified (as in the non-registered version as well), the manually specified search name will be displayed in the print layout. Description If a known search name is specified under the item number, the description of the item will be retrieved. Here, too, the description can be manually entered or adjusted. Number As a default, the number 1 will be entered here. Price per item If a known search name is specified here under the item number, the price per item will be retrieved. A number can also be manually entered or adjusted here. Price This is the price per item x number of items. VAT If you chose Print VAT on invoice in Settings, then the appropriate VAT will be displayed here when a known search name is specified under the item number. The VAT can also be manually entered or adjusted. Concluding sentence The ‘Payment within X days…’ sentence is standard. The sentence beneath this can be specified under Concluding sentence on invoice in Settings. Comment In the white text at the bottom of the invoice, you can add a comment regarding the invoice. You can also specify a Default comment on invoice in Settings. Each of the invoices you create will include this customisable text from Settings. By clicking on the arrow at the start of the invoice line, you will go to the invoice concerned. You can re-print the invoice using the printer button behind the invoice. If the payment period of an invoice has been exceeded, the background colour for the period will be red. Search in the layout, for example for the period 01-10-2005…31-12-2005 in the Date field, in order to receive an overview of the VAT received in the last quarter of 2005. 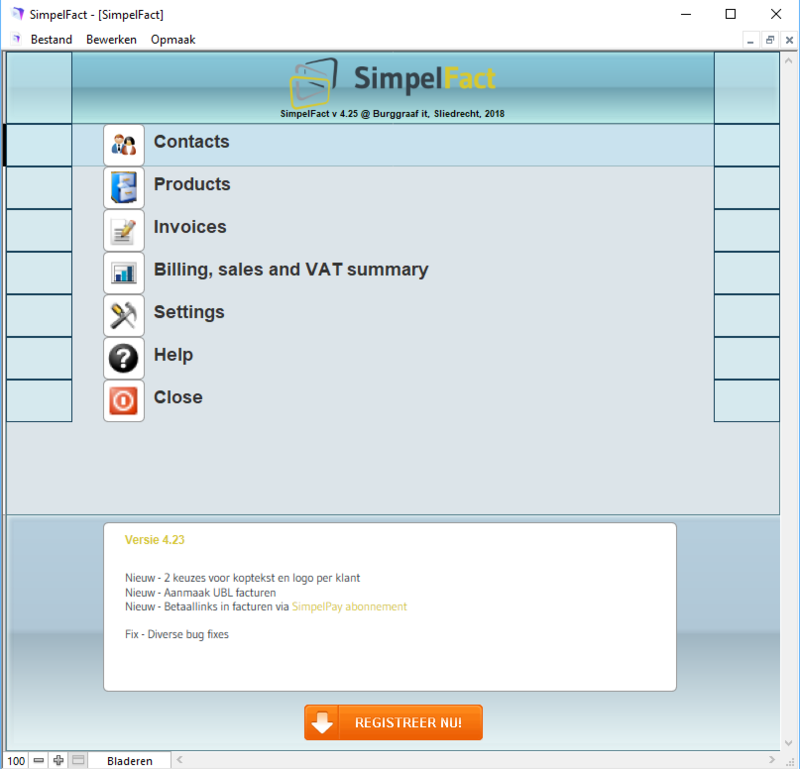 SimpelFact is installed in the documents folder on a Windows PC. In particular, the SimpelFact.sft file contains all of the necessary details. 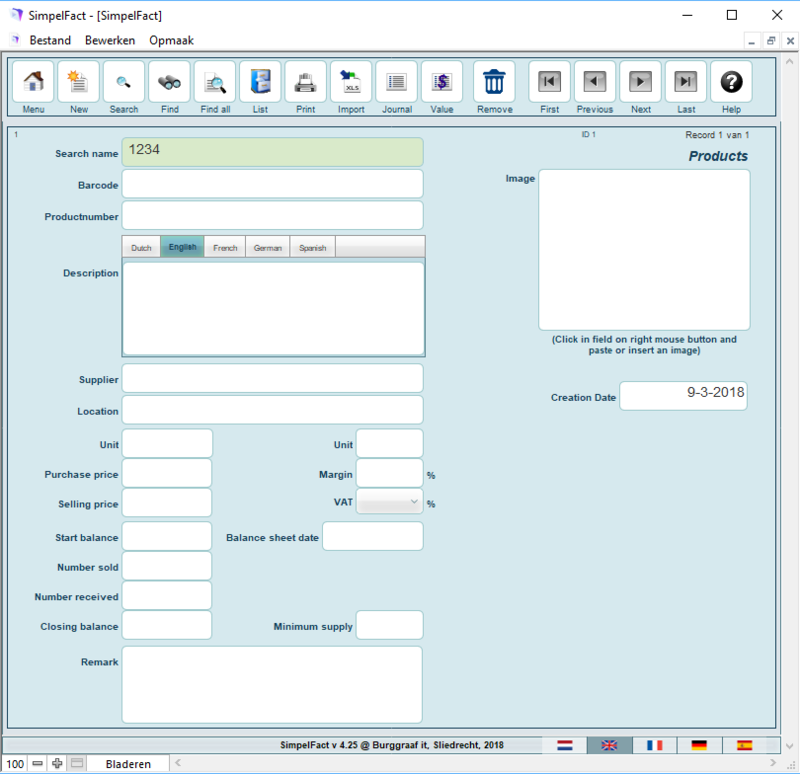 If you wish to make a full backup of SimpelFact, we advise you to copy the entire contents of the folder Burggraaf it/SimpelFactxx to a safe place.